News about Germany's Chancellor Angela Merkel has been busily crossing the wires ever since the German federal election results came in. Although the results are disappointing, Chancellor Merkel and her party still have the advantage to govern. Merkel managed to win a fourth term in the German Election on Sunday, but her victory was a bit overshadowed by the hard-right AfD party, which won 13.3% of the vote. The EUR/USD reacted with a common gap (head and shoulders, tradable), and I predicted a possible gap close on Twitter, right after the market opened. The gap almost closed, getting just 6 pips away from Friday's market close. It appears that Merkel will face challenges to form a governing coalition that can minimise the impact of the far-right party – Alternative für Deutschland (AfP) – as it has swept into the German parliament for the first time in over fifty years. One of the key challenges for Merkel is to bring together the pro-business FDP and the Green Party to form a coalition. This is a challenge as they intensely oppose each other, which could affect the voters' support. It could take us until Christmas before a coalition is formed, and such a failure could trigger fresh elections. The right-wing populist party, AfP, are facing their own challenges, with the resignation of Chairwoman – Frauke Petry – which is likely going to trigger inner-party turmoil, to the benefit of Merkel. A continuation of the current "grand" coalition between the CDU/CSU and the SPF would form a majority in parliament; however, this was ruled out by the SPD's lead candidate, Martin Schulz. 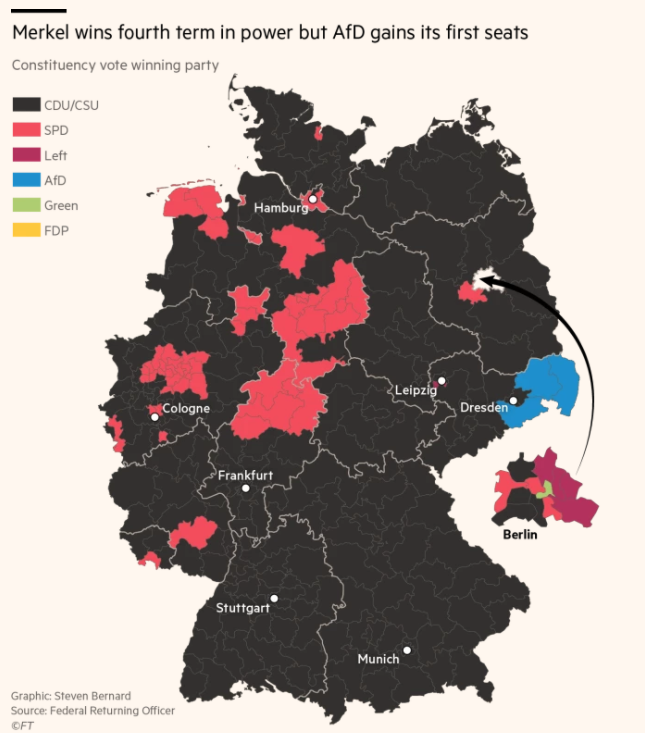 Germany is now to have six parties in the Bundestag, and only two coalitions can remain mathematically and politically, in my opinion – either the continuation of the Great Coalition, CDU/CSU and SPD, or the Jamaica coalition – CDU/CSU, FDP, and Green. 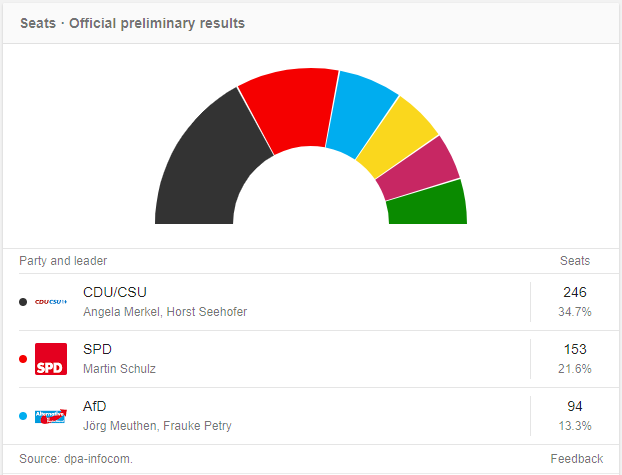 At this point, a coalition between the CDU, the FDP, and the Green Party is a possible outcome. The Jamaica Coalition was named after the colours traditionally associated with the groups. Should talks about a grand coalition or a Jamaica solution break down, Merkel could consider a minority government, supported by all of her three potential coalition partners. In times of crisis, she would be able to count on the FDP, the Greens, and the SPD to back her – as the Social Democrats did on key votes during the Eurozone crisis. My personal opinion is that the biggest loss for Merkel's party was due to an imbalanced approach with her EU partners with regard to refugees and immigrants. The AfD would never have made it this far if other European countries had had a more balanced approach in handling the crisis themselves (think Poland and Hungary). Germany might experience payback time now and come up with a harder stance regarding Europe's solidarity over the immigration and refugee crises. Don't forget that Germany is a very stable democracy, and the vote for the AfD was probably done out of protest. In my opinion, even this populist onslaught won't shake the firm foundations of the German democratic base, as Merkel should be able to cope with the result. When the people of a country give credit to one leader so many times, this should be treated as a sign of that particular leader being a reliable person in the eyes of their own people. This is also an affirmation for Merkel, who opened the door to another term. It's well documented that a "fatigue repetition" can occur among voters, caused by higher expectations than the objective possibilities of the current government. That considered, Angela Merkel's victory is even greater. What is unknown at this point is who Merkel's coalition partner will be, within the difficult circumstances of strengthening the German right (which Europe should be worried about), but it is certain that Germany's political course will remain the same, ensuring Germany's central position in Europe. With a possible grand coalition ruled out, it seems that Merkel is unlikely to win over the Free Democrats, and skeptics in her own party. France and Germany may agree to establish a form of budget and an oversight position of a finance minister for the Eurozone, but I think neither will have the scope that both the French and many other economists have been hoping for. The rise of the AfD will possibly make efforts to reform the Eurozone a bit harder. The FDP have been criticising the French President's plans for reforming the EU and will (possibly) not agree to any coalition unless Merkel takes a change of direction on the EU. Christian Lindner, leader of the liberal FDP party, confirmed his opposition to drafting a strong budget for the euro zone. Seemingly opposing French President Macron's agenda for EU reform, which he is been planning to present on Tuesday. Let's have a look at the imminent impact on the DAX 30, EUR/USD, and the EUR/GBP. 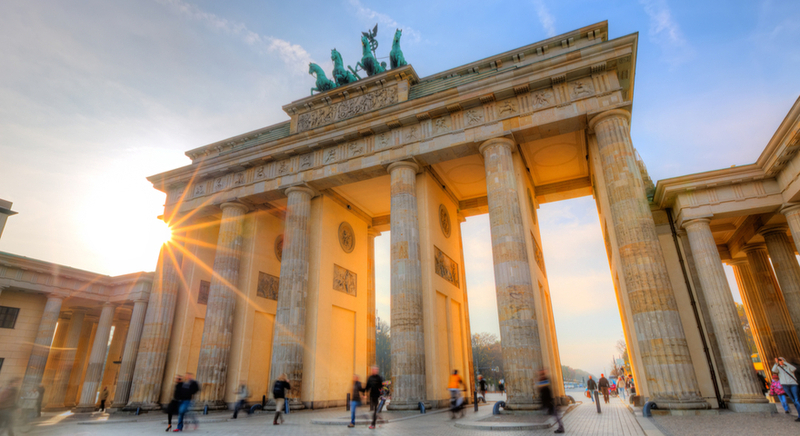 The DAX 30, being the main equities index for the German Stock Market, dropped some 50pts on Monday morning as a result of the German federal election over the weekend. This was largely due to Merkel still requiring a coalition to govern and also due to the rise in seats for the AfD. Looking at the charts, we can see conflicting signals with various TFs. monthly and weekly TFs are not really indicating weakness, whereas daily, 4H, and 2H time frames are showing signs of exhaustion. If the bears win, I would be looking for supports at 12500, the Big Round Number (BRN), with lower supports at the – 12474; on the daily time frame, at 12342 – EMA 89, and 12242 – the double bottom. These lower targets are the worst-case scenario. Unlikely, but there should be plenty of supports at the next two BRNs. A continuation in the upward direction above 12648 (double top) should target 12677 and 12742 – strong resistance. The rise of the AfD and a tight win by Merkel instilled some doubts in the strength of the Euro. Nevertheless, the EUR/USD technicals show signs of retracement and exhaustion. 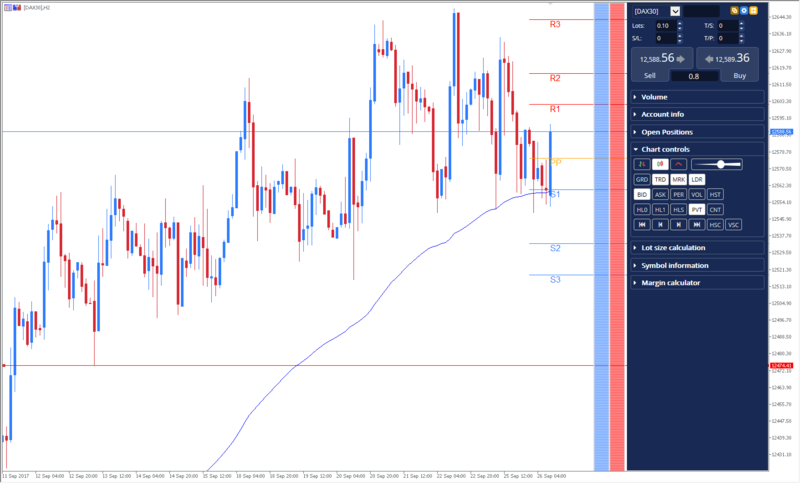 Intraday and intraweek traders should pay attention to the 1.1900 zone that is a Quarterly H4 resistance, which could possibly be sold on subsequent retracements; for short-term traders, the 1.1790-60 zone (Monthly camarilla L3 support) might be good for long intraday or scalp positions providing that 1.1740 holds. If 1.1740 fails, 1.1684-64 could be next as it shows a strong support of monthly L4 and Quarterly camarilla levels. The EUR/USD needs to get back into the rising channel, or the bears will take their lead. Only a strong close above 1.2030 could renew the strength of the EUR/USD as we can see on the daily chart. The EUR/GBP is not expected to react heavily after the elections, and currently, it shows bearish consolidation. Weekly L5 support is the final weekly support for the pair, and 0.8730 could be a chance for bulls to get into long positions. We can see that the channel (Andrew's Pitchfork) is now pointing upside, so we might see a bounce towards 0.8819, 0.8885, and 0.8918 if a bounce from 0.8730 occurs. The CCI is already oversold. Otherwise, a strong 4h or daily close below 0.8700 could aim for 0.8610. For more information on the possible impact, feel free to watch the video below (English only). The German federal election may be over, but the story doesn't end there, the financial world never stops spinning! Admiral Markets is your number one partner for trading Forex and CFDs on shares, stock indices, commodities, bonds and cryptocurrencies. Our regular, free, webinars are a great place to soak up some actionable advice and valuable trading information – don't forget to check them out!